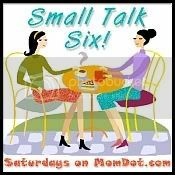 Moments of Mommyhood: Small Talk Six-Mardi Gras Style! This week I have decided to participate in Small Talk Six! It's a fun meme that takes place on Saturdays and is hosted by MomDot! Go check it out for the details! Today’s topic is the “6 things you would be willing to flash someone for.” You can answer this with a list of 6 words, 6 phrases, 6 sentences, 6 paragraphs, 6 photos, 6 videos, etc . An all expense paid vacation....ALONE! I really need a break. I would like to use the bathroom alone. I want control of the remote control. I want to play MY music. Loud. The list could go on, but it could also take days and I'm not sure you would want to hang around here for that long. You get the idea, right? Let me go to Mardi Gras! HAHA. In order to flash someone, it would have to be like a lifetime of free vacations, a permanent personal cook and house cleaner! Yeah, I'm pretty squeemish about showing off my flesh. Was even MORE squeemish before I had babies and had NO reason to feel squeemish. I think you should get a vacation, anyway. That all sounds so nice! I could use a vacation myself! BTW, your new haircut looks GREAT! I almost didn't recognize you! I would be willing to do that too! I would use that list and I would add: to be able to scrap or stamp during the day, without hands grabbing my materials. Haha-I like the 'I want to listen to my music' one....all those years we subjected my parents to listen to our dreaded music! Sounds great to me! Can I hide in your suitcase? Oh that would be nice. I could use one too. That sounds soooooooooo good, but I know I would be missing the craziness after a half a day. Perfect! I would do the same thing! Heck, I would run around my block naked for that and my block is a bit over a mile around. Can you even imagine? I can't remember the last time I truly did something alone that I really enjoyed. Work and grocery shopping? I do that alone, but I wouldn't exactly call it a vacation!!! what a great list. One of the most original lits I've seen in the Small Talk posts. There isn't much I wouldn't do for an all expense paid vacation alone. For $1.50 I would flash anyone. No let's make it $2.50. No more cooking or cleaning for life! I'd flash a couple times for that one! A maid, chef, nanny, personal asst. and personal trainer...YEP that's what I want! Great list! Well, who do you gotta flash? 'Cuz, I'd flash hubby for a candy bar. I'd flash for one million dollars. See, you can't tell that I'm imitating Dr. Evil right now. Oh I am so with ya on that one! Did you just get your hair done?? It looks totally fabulous! Sounds like you know exactly how I'm feeling too. I love your list. thanks for joining my blog and your hair is gorgeous!